"Chemotherapy." Just the word may make you remember images you've seen in movies or on TV. If you or someone you love needs chemo, is that what you're headed for? Maybe, but maybe not. Yes, it will probably be hard and have side effects. But you might be surprised by some of the things people who have been through chemo would want you to keep in mind. 1. "I don't want to hear about your friend, sister, or dog walker's chemotherapy experience." "One of the biggest things patients complain about is how many people share cancer "horror stories" with them while they're in the middle of treatment," says Marisa C. Weiss, MD, author of Living Well Beyond Breast Cancer. "The individual telling the story may mean well, but usually they're not thinking before they speak," says Weiss, president and founder of BreastCancer.org. "The last thing someone going through chemotherapy wants to hear is about how treatment went poorly for someone else." Her advice: The minute someone begins sharing, hold a hand up and say, "Thank you for caring, but I don't want to hear stories about other people right now." 2. "The most helpful information didn't come from my oncologist." "Yes, doctors are really important. But when I hear that a friend or family member is going through cancer treatment, I tell them to talk to the nurses," says Dana Kuznetzkoff, a New York film and TV producer who was treated for lymphoma in 2010. "They're the ones who will tell you exactly what you need to know, like your hair will fall out on the second day of treatment, or expect to be really tired the day after chemotherapy." She has a simple suggestion. "Listen to other people who've been there or who are involved in your care, too. I got good tips from my wigmaker and other women who'd been through cancer treatment." 3. "It's not just about nausea and hair loss." When Paulette Sherman was treated for breast cancer several years ago, "I was shocked when my toenails fell off," says Sherman, a psychologist and author living in Brooklyn, NY. "I knew my hair would fall out, but didn't remember [my doctor] telling me about the nails. It was a little upsetting at first, because it was one more way chemotherapy was affecting my body." 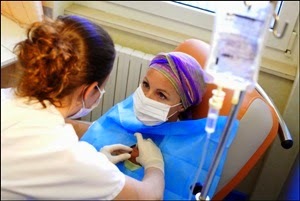 There are many types of chemotherapy. The side effects you have depend on what kind of chemotherapy you get and how your body reacts to it. Hair loss and nausea are common, but they don't happen to everyone. It's also common to have other side effects that people don't talk about as much, such as trouble with memory and concentration, feeling dizzy, or having pain and numbness during or after chemotherapy. 4. "I don't want to think about cancer all the time." You're much more than a patient. You're a person with a full life. Your daily routines - even the little things - can hold comfort as an anchor when cancer rocks your world. Still, you'll want to be realistic and flexible about it. Sherman often took a day off work the day following a chemotherapy treatment because that was when she felt the most side effects. She worked during the rest of her treatment, though. "Many people were surprised by that," she says. "I love my work and get energy from it. It's different for everyone. But for me, it was important to have part of my life be "normal." I didn't want cancer to take over my entire life." 5. "I can't support you emotionally right now." Friends and family may be upset about what you're going through. That's understandable, but you can't wear yourself out reassuring them. "I told the people closest to me, "I'm happy to tell you how I'm doing when I can, but I need to take care of myself. If you need extra emotional support or more information than I've given you, please reach out to someone else," Kuznetzkoff says. While it was hard to do this, "It was crucial for keeping my own stress levels down, which helped me get healthy," she says. "I tell patients to have a "point person," like a spouse or good friend, who can update the people whom the patient wants to keep in the loop," says S. Adam Ramin, MD, who treats men with prostate cancer. "That way, not every update becomes a difficult or emotional conversation." If someone seems to be having a really hard time, you may want to suggest that they speak with a counselor who can give them the support that you want them to have but are not in a position to offer. 6. "Chemotherapy is over and I feel depressed." Your friends and family may want to celebrate the end of your cancer treatment, not realizing that instead of feeling excited or triumphant, you may feel blue, anxious, let down, or even scared. These feelings are normal, especially in - the year following treatment. "During chemotherapy and radiation, you've got everyone's support. When you're done, people often expect things to go right back to normal for you, when you're still experiencing mental and physical side effects," Weiss says. No need to fake it. Instead, tell well-meaning loved ones you're adjusting and doing the best you can. Talk to your doctor about how you're feeling, too. Counselling (plus medication such as antidepressants, if needed), support groups, exercise, and taking time for yourself can help you feel better and ease back into your post-treatment life.